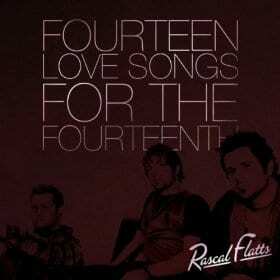 Rascal Flatts and Lyric Street are offering fans a special Valentines Day song bundle, 14 Love Songs For The 14th. The 14-track bundle offers some of the group’s more passionate songs from previous CDs including “Bless the Broken Road,” “Unstoppable” and “My Wish.” The specially priced digital-only package is available at retailers such as iTunes and Amazon for only two weeks starting Feb. 9. …of course if you’re a Flatts fan then you probably already have all of these songs. So just go make a play list to match. If you’re new though this would be an excellent album to buy because the songs are some of their best stuff. I’m a big fan of Rascal Flatts, but this seems like an unnecessaaryu release. Anyways all songs on here are great.